Looking like the setting for a certain school of wizardry, Great Griffin is a very gothic-style pokie from Microgaming that has 5 reels and the grand total of 50 paylines. It’s beautifully designed with exceptionally high quality images that have something of a 3D effect, and with all symbols related to the theme it’s a visual treat as well as a potentially rewarding one. Bonus features include a free spins round where players get to choose the number of spins and multipliers, extra wilds, and a pick a prize game. Griffins are a mythical loin and eagle hybrid, and the star of this particular pokie pops up from time to time for additional payouts, while also being the highest value symbols of all. A realistic background image of a great hall, with vaulted ceiling sets the reels off nicely, while a decorative crest tops them off. With 50 lines, the payline indicators look a little out of place, but at least it gives players a huge range of potential bet sizes. By using the control panel below the reels, they can bet just 0.01 on a single line if they want to, or activate all of them and qualify for all winning combinations that land on the reels for a wager of 0.50. Each coin can be adjusted up to a maximum of 0.20, while up to 10 coins can be used on each line. Add this all up and players can stake up to 100.00 per spin. Clicking the View Pays button takes players to the information needed to see what bonus features they can expect to see and how much each symbol will be worth when it lands on an active line, running from the left reel. Lower value icons include a feather, set of scales, magical plant, mortar and pestle, potions and a spell book. Higher prizes come with candles, a cute baby griffin hatching from an egg, a flower and the griffin talon clutching an orb. Land the griffin and a couple of things can happen. First of all it’s a wild symbol which substitutes for all the regular ones if it helps to complete a winning line, and then if it lands right across the reels on its own players can win up to 5000x the line stake. The friendly griffin can also fly across the reels at random in a fantastic animation, dropping extra wild symbols onto the reels. 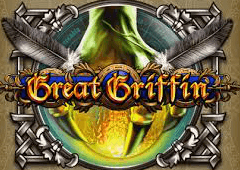 The Great Griffin logo is a scatter symbol, meaning that it doesn’t have to land on a line to pay a prize that’s between 3x and 200x the total bet when between 2 and 5 appear at once. If 3 or more appear, it also triggers a free spins game, with players being given a choice of how they play out. The options are 15 free spins, with any wins multiplied by 3x, 10 spins with a 5x multiplier in place throughout, or just 5 spins, but with any winnings being worth 10x the base amount. The overall payouts are broadly the same, so it’s just a matter of deciding if they want lots of spins or the chance of bigger wins. The other bonus game starts when the haunting image of a hooded lady lands in 3 positions on reels 2, 3 and 4. She changes into Pick Me symbols and clicking on any of them awards either a random prize, a prize and a second pick, or a win all payout, with up to 150x the triggering bet available. After a win, players can choose to gamble it, doubling the amount just won by correctly guessing if a playing card will be revealed as red or black, or quadrupling it by getting the correct suit. If they guess right, there’s the option to collect the win or go again for an even bigger payout, but an incorrect one loses the lot. Great Griffin is an outstanding game that really has it all. Fantastic animations, advanced graphics and some great bonus rounds mean that this is one of the few pokies where it’s hard to think of how the developers could have improved it. Some people like to see the playing card icons as lower value symbols, as they have a clearer idea of what payouts to expect, but when the symbols look this good, who can complain? Just be careful with the gamble game, as these tend to be very tricky to play and it’s perhaps not worth risking bigger prizes when the odds of coming away with a boosted win are 50/50 at best.